Pretty? No artificial colourings & flavourings added! How it is done? Pandan Magic Custard Cake of course needs pandan flavours hahaha....Inspired by Baking Tai Tai's version, instead of using pandan essence/paste, I've actually blended some fresh pandan leaves with the milk to obtain the natural colours and flavours :) So happy with the natural soothing green hue! Of course the taste of the cake is good too, is like eating a slice of pandan kaya layer cake! This is how it looks when out of oven ;) but the surface will be more wrinkled after further cooling down. Preheat oven to 180 deg cel. Lightly grease and fully line a 7" square pan with baking paper slightly overhang the edge of the pan. Melt butter and set aside and cool down slightly. 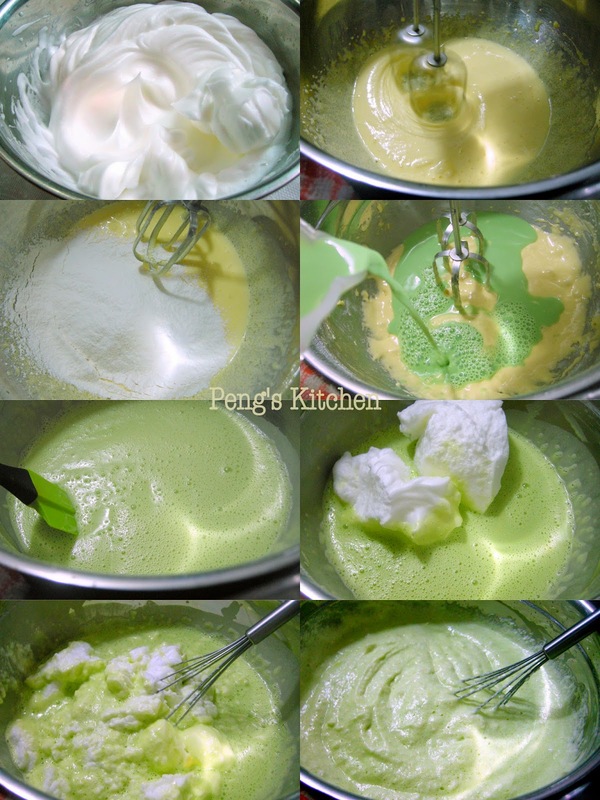 Blend the cut pandan leaves with the milk till smooth. Strain the mixture thoroughly and discard the pulps. In a separate mixing bowl, beat the egg yolks, sugar& salt till pale and creamy. Beat in melted butter for about 2 mins until evenly incorporated. Sift in flour and beat until combined. Slowly beat in milk and coconut milk. Mixture will be watery. Hi Peng! I love the soft green color of your Pandan Magic Custard Cake! Thank you for sharing with us! Your magic cake really so lovely! Cheryl....thanks for dropping by! still trying very hard to get a good 3 layers hahaha not giving up yet :D I'm a matcha fan too but next I would very like to attempt a pink one! finally i got the opportunity to find a handmade pandan version!! Thanks for the recipe. It worked I baked it today for my wedding anniversary. I could see the 3 layers clearly. The only difference i made is i used bread flour..though the cake rose it bit too high and one side just exploded a bit. Taste wise good but it was also to strong a pandan flavour with a slight tinge of bitterness. Texture wise it was soft and spongy cake with 2 visible layers at bottom. Hope to try the plain vanilla version using the exact recipe sometime soon. I just baked this but I only get 1 layer, the custard! Any reasons why? I used cake flour, the only variation. Siew Mei Low...did u beat the whites till stiff, you may have fully deflated the meringue while folding it that's why the cake layer is missing. Hi Peng. I saw your recipe and loved it! I decided to try to bake it according to your instructions. However my cake came out with 2/3 custard and only the top 1/3 (more like a thin line) is cake. Could you please advise where I went wrong. Btw, is it alright to add in 1/4 tsp of cream of tartar when whipping the egg white? (I didn't in this cake).